With Sew Much Cosplay’s Awesome Armor Cosplay Snips, creating armor just became a snap! This scissor’s extra-long blades allow for smooth and precise cutting, making it perfect for the heavy and dense materials that go into making armor. The enlarged handle is designed for unisex use and comfort, so anyone and everyone can become an expert cosplayer! You will never have to struggle with cutting foam, plastics, leather, and other bulky materials ever again. 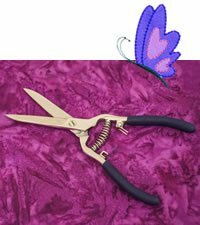 Our Awesome Armor Cosplay Snips are the perfect addition to your creative arsenal! For use with: foam, plastics, leather, suede, thermoplastic, denim, pleather, faux fur, neoprene, and sew much more!